Daventry Town manager Darran Foster has acted quickly to strengthen his squad, by signing four new players. They join the eight from last season’s squad who have already committed to the club for another push at promotion. Foster has signed winger Dior Angus from Conference North club Solihull Moors. The Moors finished eighth last season with Angus - son of former Northampton Town defender Terry - scoring one goal in his 10 appearances for the club. Angus had joined Moors from Kidderminster Harriers the previous season when aged 19, having made 29 appearances for the Conference North club, scoring seven goals. Angus made six appearances at Aggborough, without scoring before returning to The Moors later in the season. Angus had begun his career at Leamington in 2011, making just three appearances and scoring two goals before moving on to Banbury United, where he scored four goals in 13 appearances. Foster has already recruited three more players to his squad two weeks ago, signing former Bedworth United and Rugby Town striker Mitchell Piggon, former Banbury United central midfielder Josh Cole and centre back/left back Nathan Haines, who has signed from promotion rivals Rugby Town. 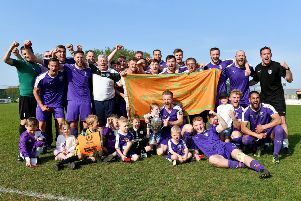 Eight players including goalkeeper Richard Morris, captain and player of the season Liam Dolman, utility player Josh Blake, full back Ollie Wilkinson, midfield pair Ross Oulton and Ryan Howell, winger Josh O’Grady and the returning centre back Kyle Cartwright are all set to return to Town next season. With England out of the World Cup, many of the town’s football supporters will be looking forward to watching some local ‘live’ football action again. In two weeks’ time, on Tuesday, July 8, Town start their pre-season programme with a local derby against Conference North side Brackley Town at Communications Park. Jon Brady’s side finished seventh in the Conference North last season so should provide really tough opposition for a Daventry team currently in transition.